First and foremost I don't like Sirius and don't think anyone should own it unless they have the money to lose. I own 40,000 shares that I'm in for virtually free. When Sirius was talking about going bankrupt I decided to buy in at a nickel which ran me $2167 (.054 cents a share + commissions). I did not think they were going to file chapter 11 with the speculation talk being that their debt was about to be purchased (I definitely got lucky)... Sure enough Sirius is still fighting for their life, and in the mean time has risen 1000%... I believe it was when the stock was at about 15 cents when I wrote out every single share I own for a nickel a share ($5 per contract) for the $2.50 January 2010 strike. So after commissions I am only in for $474 ($7 for options trade + 400 contracts X .75 + $7 for stock trade + .004 cents a share cost). I think Sirius can get to $1 just based on the chart alone, not to mention that the have a "Sirius" following- don't believe me go say something negative about SIRI in the Google Finance message boards! I cringe when I talk about SIRI because I am not fond of penny stocks, but because I listen to CNBC and Bloomberg constantly on my Sirius Satellite radio I know how great their product is compared to terrestrial radio. Now because the stock has moved so much in the past 2 months (1000%), I have become both cautious and curious. By looking at the chart below, you can see there was resistance at around 45 cents (I have drawn lines on each resistance point), and once SIRI broke through that it was a quick pop up to 53 cents and closed at 50 cents. It is key to hold above this level and not break back down below it. The next resistance is at the .58 level which if we can break above that it might be a quick test to .68 before we settle down (resistance levels are close so it could move through both easily in just one trading session). Once again if it breaks through 58 cents we'll need to hold above it, and eventually break through the .68 level. Finally as we can see after the 68 cents level there is no resistance in sight until about $1.05 (stocks rise just as they do fall, and this stock fell fast!). In theory if this stock speeds through the .68 level we could see buying just on the technical side and it could easily push us up above $1 (click on the chart for a larger more clear picture). I looked at the short interest and it is 4.79% which isn't as high as I expected it to be. However if shorts get spooked, even a quarter of the shorts covering will carry this stock up. Both types of this buying (technical buying, and short covering) will cause a higher Alpha in the stock, and make it look more attractive. Not to mention any changes in the uptick rule will greatly benefit this stock. I think a key report to watch for is their earnings on May 11, 2009 and see what the company has to say to give investors confidence. For the options expiration week of April 13, 2009 the week ended stronger for the sixth week in a row. The S&P 500 finished the week up $13.15 or 1.54%, the Nasdaq finished the week up 23.52 or 1.43%, and the Dow Jones Industrial Average finished the week up 45.42 or .56%. This market seems to be very tired. Earnings even on the on the positive (surprise) side don't seem to be having a great effect, as the did a week or so ago. To hedge myself and the substantial amount of money Ive made over the past 6 weeks, I purchased some BGZ around 45 a share today. I think with next weeks very busy earnings schedule and a few misses (negative surprises), we may have a short bear raid. I could be wrong but I think any negative news could make this market react quite bearish. On the other hand these names could surprise as well (down year/year but not being as bad as most analysts predicted), and there is still a huge amount of money on the sidelines just waiting to jump in this market. The market won't wait for anyone so with next weeks earnings giving us any sign of a market/economic bottom, we may continue to go higher across the board. I am thrilled to say I will not get called out on any of the covered calls I've written in the past month- even with this extreme up movement all month! I was smart enough to wait to write the majority of my calls with about 20 days left until expiration. There were a few very close calls such as: the PALM 10's, the APWR 7.50's, the GOOG 410's, the DIG 25's, and several more. I netted a huge profit (free money) for my April covered call options, and I expect to write out the stocks again for May, at an even higher strike price! Major influences on the market next week will be earnings again with 40% of the DOW 30 reporting. BAC kicks the week off with first quarter results, so we could have another rally considering the new relaxed accounting rules- I am confident they'll beat estimates. However if they upset and miss earnings we could see all the gains in the financials over the past week erased. First and foremost I should say that I am not a fan of CNBC and would choose to watch Bloomberg instead. However coverage of the market after hours is not too great on Bloomberg. CNBC's Fast Money is a show which talks a lot about options compared to any other program I know on TV. Therefore I've become quite familiar with Dylan Ratigan and I was wondering where he went. To my surprise he quit after having a dispute with his producer Susan Krakower. Apparently he was caught on tape flipping out at his producer about reading emails. His last day on the show was March 27,2009. You can listen to a recent interview with Ratiagn on Goldseek.com Radio by clicking here. Many times I've heard people say why is the Dow Jones Industrial Average (DJIA) so much higher than the S&P 500, when the DJIA consists of just 30 stocks and the S&P 500 consists of 500? The answer to this is quite easy and just takes a little calculating. The Dow Jones Index is weighted unlike the S&P 500. The S&P 500 is weighted by market cap; the larger the stock the more affect it has on the daily move of the S&P index. However the DJIA has a weighting so that a 1 point move in any of the 30 stocks will move the index by an equal number of points. To understand this you need a quick history lesson. In 1896 to be exact the index consisted of just 12 stocks, and to get the average back then all you'd need to do is divide the total price of all 12 stocks by 12... Easy isn't it! But if that were the case today it would mean that the basket of 30 stocks in the DJIA would sum to around 243,750 as of toady's close anyway. As you may know this is not how you get the average. Over time stocks were added and taken out of the index, as well as stock splits and spinoffs, etc... In order to keep the DJIA consistent the "divisor" must also change. The current divisor is published on page C4 of the Wall Street Journal daily. The current divisor as of April 17, 2009 is .125552709. To get an idea of what this means we'll divide 1 point by the divisor and we get 7.9647. This means that a 1 point change in any of the 30 stocks will move the index up/down by 7.9647 points. For example we'll say that 28 of the 30 Dow components finish the day unchanged but BAC and C both moved up 1 point, we could calculate the index average change by dividing 2 by the divisor... The index would move higher by 15.93 points on this day. Since all of the 30 Dow stocks are weighted so that a one point change affects the index equally, one would have to take the sum of all 30 stock prices in the Dow index and divide by the Dow divisor. The picture below shows a spreadsheet of the Dow 30 and how it would affect the Dow Jones Index if any given security went to 0. 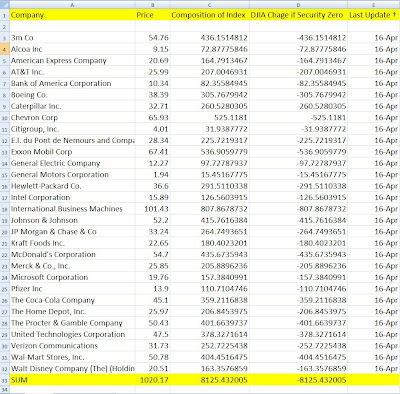 Also you can see that the total sum of all 30 Dow stock prices is equal to 1020.17 which when divided by the current divisor will give you the close price on April 16, 2009; 8125.43. Breaking News: Google reports Blockbuster Q1 results as I expected! Google reported earnings for the first quarter of: $5.16 versus $4.93 per share estimate. Revenue reported for Q1 was: $5.51 billion growing 6% from Q1 2008. Revenue generated from Google owned sites was $3.7 billion versus an estimate of $3.54 billion. Paid click growth of 17% beats estimates. Google added $2 billion is cash! Shares look to be gaining steam after hours trading as high as 410 per share. Google Earnings on Deck What Could a Blockbuster Report Mean for Yahoo! Google is scheduled to report earnings after the bell today with a consensus estimate of $4.93 per share. Analysts have revised these numbers down a lot and with Google fetching $5.10 a share last quarter they could easily beat the high estimate of $5.30 a share. If Google has a blockbuster report which is possible (Analysts revising price targets and earnings recently! Very bullish signal), this could take Yahoo with it above 15 a share in tomorrow's trading session (assuming it doesn't get above that today). I think that Google could easily fetch over $5 a share considering the amount of time spent on the Internet has increased substantially in the past quarter (cold outside for much of the United States= less to do outside, and recession= people cutting costs and entertaining themselves at home cheaply such as browsing the web). I honestly think Google could report better than expected earnings and assuming they get above 400 a share they could easily get to 440, then next resistance points are: around 460, 485 and then even 515! If Google misses earnings they could test support at 335 and then 285. Watch Yahoo, with Yahoo! talking with Microsoft and if Google beats earnings we could see Yahoo over 15 a share easily by April options expiration (tomorrow)! As of now the options market is factoring in a 40% chance Google reaches 400+ by tomorrow- not as convincing as I'd like to see it but we'll see what earnings brings us. AXP & GS on Fire. Can They Bring the Other Financials With Them by Market Close? GS is having a nice bounce today, but that may be because it was hammered yesterday over 15 points. However American Express seems to be on fire in the last 20 minutes due to credit card delinquencies holding steady in March. It is up almost $1 in today's trading session. It is 2:48 right now and in 12 minutes the market is about to get real volatile. Looking at the trend for AXP I'd say it finishes up over $1, but if the market starts to sell off there isn't a hope that AXP even finishes up. By taking a quick glance at the chart I think if AXP can get over 20 at any point by 4pm it could easily rally another 2% to $20.40 by market close. If AXP takes off it will most likely bring other financials with it such as the lagging banks today, like Bank of America (BAC) and Citigroup (C). Breaking news: Beige book released: Overall this is showing a sign of the economy bottoming. This is the best report we've had in a while. Manufacturing was weaker in most districts. Housing was still weak but is showing signs of improvement. Consumer spending remained weak as well, but some districts reported that retail sales are starting to stabilize. Unemployment still seemed to lose steam as across most industries with very few reporting hiring. Signs of stabilization: 5 of 12 districts showed signs of housing declining compared to 10 of 12 in the last report. This is a good sign the economy may be bottoming. As the Fed said "Housing markets remained depressed overall, but there were some signs that conditions may be stabilizing". The market looks like it is gaining steam on this report. The old saying goes "paying taxes is a good thing, it means you made money". This is very true! I agree with this saying I just don't like parting with 28% of my profits. I'll share a quick tax story with you. For the year 2008 I averaged more trades than ever before. This year I received my detailed gain/loss tax statement via UPS Ground. Yes very thick and heavy and almost 200 pages of trade info. As I gave her the papers she looked them over for a second, and said "you're a trading MONSTER!". She looked at me as if I committed a crime. Then she asked me if I has access to Gains Keeper. Fortunately for my tax lady (and my wallet) TDAmeritrade has software called "gainskeeper" which is ideal for doing your taxes. I was able to download the information to a spreadsheet and email it to her. This made it much easier for her to do my taxes; saving her hours of work, and saving me some money! So before next years taxes, you may want to see if your brokerage has access to gainskeeper. This makes it very easy to export data which could save you time or money when you do or get your taxes done in the future. Lessen the time period for short term capital gains from less than 1 year to less than 6 months. This wouldn't help traders like me, but would certainly help those who got into a position, made money, and then needed the money back sooner than they anticipated. Too many times someone gets cash from a position they've made money on back, and spends the entire amount of cash forgetting they need to pay taxes on the gains. Be able to write more than $3,000 off ordinary income taxes; raising it by 66.67% to say $5,000. In 2008 a lot of people realized a lot of losses. Trust me when people panic they tend to sell at the bottom which many did in those few weeks in October and November... Say someone lost $20,000 realized in the market in 2008 and decided never to invest again. They would roll $3,000 forward for 6 years and in the 7th year they could write off the last $2,000 on their income. Think of it this way: Joe the plumber made $36,000 in 2008, and panicked at the market bottom and cashed out all of his investments. Joe takes a $5,000 bath on his stocks he thought were so great to hold for the past 10 years. Lets assume the only thing Joe can write off are his losses on his stock investments. Joe made between $32,550 and $78,850 which would put him in the 25% tax bracket. Joe can write $3,000 off on his income, but he is still in the 25% tax bracket by $450. However if he didn't have to wait until 2009 to write off the last $2,000 he lost, he would save a lot of tax dollars! If he could write off the $5,000 instead of $3,000 he could lower his percentage to 20% instead of paying 25%! Assuming Joe cannot write anything else except his capital losses he would have paid $8,250 in taxes to the IRS for year 2008, but if he could write off the $5,000 he would pay $6,200 in taxes. This is certainly a stimulus! There are many other great ideas these are just 3 ideas that would save the average American a bundle! Assuming these were put into place the same amount of money would most likely be paid in dollars to the IRS! If these plans were announced it would cause the markets to rally, causing people to make more money, and pay more $ in taxes but at lower %. These are the things Washington needs to look at doing as ways of stimulating the economy... Happy Tax Day. The uptick rule was put in place in 1938 after being passed in the Securities Exchange Act of 1934. On July 6 of 2007 the rule was suspended, just months before the stock market decline started. I am not attributing all of the decline to the elimination of the uptick rule, but it certainly made it much easier for losses to accelerate, especially on those days where we were down 400 and ended the day down 700+... Reinstating the uptick rule is a good idea in my opinion as it will allow the markets to become more stable. Without the uptick rule in place, anyone with enough buying power could essentially drive a stock to nothing, and it should not be that easy! Reinstating the uptick rule would stop these bear raids from occurring. Think about it this way... Lets say a stock is up .05 to $20.05. If someone shorted a stock and the last trade price was $20.05 but the current bid is $20 and the short seller filled all of bid size at $20, and decided to short some more, but the next highest bid is $19.95 and then filled all of those, the security would then be down .05. What if the seller continued shorting the stock on and on? The price would get hammered and it would most likely send signals to others to sell the stock, AKA creating a self-fulfilling prophecy. This is extremely dangerous for any security and if this rule is not reinstated soon we could see many more equities driven to very low levels. I think this rule should be reinstated at least until things stabilize. Putting short bans in place have not helped the market, they've only created delays. When the ban is up things go back the way they were, if not worse than before. I honestly think reinstating the rule will benefit the markets greatly. The sooner we can get it in place the better. As of now there seems to be a hurdle, because they are trying to decide which rule to use from a list of 5 different versions. Hopefully they can get a vote on which rule to use and reach an agreement to reinstate the uptick rule quickly!